Women experience hair loss differently than men. Male pattern hair loss means losing hair in the front and top of the head, leaving a “wreath” of hair around the head. Female pattern hair loss typically involves losing hair all over the head, or having bald patches in various places. Men can experience female pattern hair loss, and vice versa, but this is less common. Females can lose hair for a wide variety of reasons. It is normal for women to lose excess hair after having a baby, for example. Fungal infections are another cause of hair loss in women, treatable with medicine. Traction alopecia is hair damage caused by pulling the hair in a tight style, such as a bun or braids. Changing the hair style and brushing with a wide tooth comb can halt this condition. Female hair loss can also be caused by thyroid problems, liver problems, cancer, or excess stress. Hair loss can be a symptom of a serious underlying condition and therefore requires an examination by a doctor. Androgenic alopecia is hair loss caused by excess levels of the hormone androgen. As a male hormone, androgen can create masculine hair on the body, and it can cause the hair on the top of a woman’s head to become thin and balding. If any underlying medical conditions or hormone levels cannot be corrected, then cosmetic options may be offered. These include laser therapy, for removal of unwanted hair, and hair transplantation, for moving healthy hair follicles to bald or thinning areas. Women experiencing hair loss usually become extremely self-conscious and worried. Women often consult their hair stylist before consulting a doctor. However, a consultation with a physician will help determine the cause of the hair loss and rule out any serious problems. Additionally, many causes of female pattern hair loss can be addressed. If cosmetic options are offered, hair transplantation may be considered. Hair follicles from a “donor” site on the individual’s head are transplanted to the bald or thinning spots. 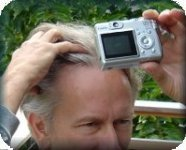 Whereas male pattern balding leaves a healthy “wreath” of hair as a donor site, female pattern balding presents more of challenge to find donor hair on the scalp. A hair transplant doctor who specializes in hair transplants, and conducts dozens of hair transplant surgeries per month, is the best choice due to the specialist’s level of experience. Hair transplantation involves local anesthetic. A strip of skin is removed from the scalp in inconspicuous “donor” regions. These areas are repaired with sutures to minimize scarring. The removed hairs are cut short and analyzed under a microscope. Then, follicular units are dissected and the balding area is given local anesthetic. 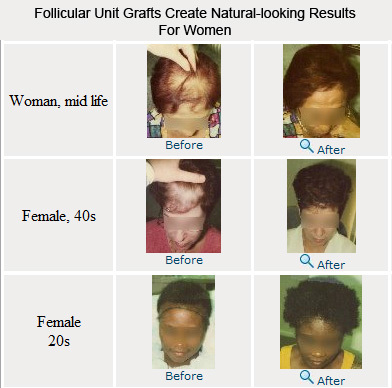 The grafts are placed into small incisions in the balding area. Approximately 3 – 6 months later, the hair transplant patient grows hair. In 9 – 12 months, full growth takes place. See more pictures and a video about hair transplants for women. Female pattern balding in women is neither inevitable with age, nor untreatable. Hair stylists can be helpful for cosmetic purposes, but only a doctor can determine the cause and offer medical treatment. This entry was posted in Baldness, Hair Damage, Hair Loss, Hair Loss in Women, Hair Problems, Hair Transplants, Health - General on October 13, 2009 by Larry Shapiro.